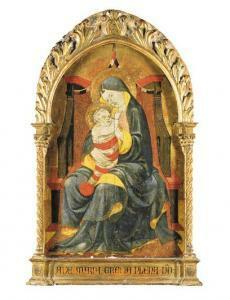 Find artworks, auction results, sale prices and pictures of Paolo Uccello at auctions worldwide. including frame: 101.5 by 58.5 cm. ; 40 by 23 in. inside panel: 80.7 by 53.3 cm. ; 31 3/4 by 21 in. With Malmedy, Cologne, where acquired by Dr. Pickardt; Dr. Pickardt until September 1967, when sold to the aunt of the previous owner (as by Francesco d'Antonio); Their anonymous sale, London, Christie's, 11 July 2001, lot 69 where acquired by the present owner. 1. See A. Padoa Rizzo, La Cappella dell'Assunta nel Duomo di Prato, Prato 1997.
with Malmedy, Cologne, from where acquired by Dr. Pickardt, by whom sold to the aunt of the present owner, September 1967, as 'Francesco d'Antonio'. Everett Fahy, to whom we are very grateful, attributed this picture with certainty to Paolo Uccello, having examined the picture in the original. He notes that 'the drawing of the drapery and the pose of the Madonna and Child are charcteristic of Ucello's early, flamboyant Gothic phase' (letter 19 October 2000). He points out its striking similarity to the pose, and execution, of the midwife holding the newborn Mary in Ucello's fresco of The Birth of Mary (Chapel of the Assunta, Prato Cathedral). 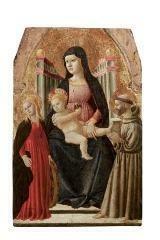 Furthermore, it can be compared with the early frescoed lunette of The Madonna and Child, detached from the Casa dei Beccuto and now in the Museo di San Marco, Florence (see A. Padoa Rizzo, La Cappella dell'Assunta nel Duomo di Prato, Prato, 1997). 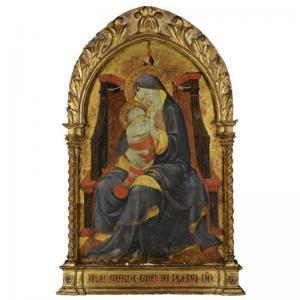 Although the flesh tones of the present picture are abraded, thus revealing the freely incised underdrawing, one can still appreciate the glazes of the volume of the heavy drapery of the Madonna's mantle, painted in tones of dark blue, contrasting with its bright yellow lining. 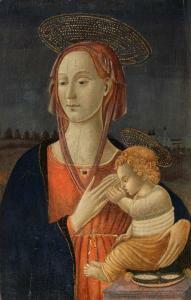 Ucello has employed a similar method of drawing by incision in the halo of the Madonna and Child. The sophisticated pattern of the gold brocade of the red cloth and its black and white border are typical of the artist's interest in geometry.